Before Peter Jackson filmed the Lord of the Rings Trilogy, the movie studios of the world had deemed such a project "unfilmable", mainly because technology hadn't caught up to the ability make a digital Orc army. Mr. Jackson managed to change the film industry's views on marketing, the way sequels are planned and filmed, and, for the purposes of this blog post, how written works are adapted to visual media. Defying the odds of the times and becoming a commercial and critical success, it is considered one, if not the most successful adaptation ever. It begs the question, what can we learn from this successful adaption? Translating a book into film faithfully is made difficult due to lack of time for audience investments. In a good book, you have 10-20 hours of characters, subplots along with the main plot that culminate in a satisfying experience. When attempting to cram all of that into a 2-2.5 hour movie, all the content will never make it in those time constraints. A “faithful” adaptation is called as such when the film version successfully conveys the overall message and tone of the book. This is the age old saying “the book was better…” because of course it is, you’ve spent more time with these characters so you’re more invested. This is also why premium channels and their 10 hour book per season model is becoming a prefered medium to tell novels. You can see this in HBOs Game of Thrones and True Blood, along with Netflix/FXs Longmire and Amazon’s The Man in the High Castle to name a few. Were we just dealing with the Fallout: Equestria book, and attempting to convey the narrative, the studio might have been better served with a linear approach to the game’s narrative. Bioware’s Mass Effect (excluding the ending) and Dragon Age series’ show how an epic, semi-linear story can still follow the standard 3-5 Act structure, but give the player enough freedom to feel like each playthrough is a unique experience, while still having decisions that impact your friends and the world around you. Congratulations! You can write for Hollywood now! Only issue with that is the second word in the title; Fallout. Fallout games, by design, are open world adventures where your character can be as angelic, demonic, helpful or impish as you please. Fallout: Equestria is a novel with a linear plot structure. How do you transfer that into an open world game, an entertainment medium with a traditionally nonlinear plot? After scratching our heads for a while, we eventually decided to look to the masters. If we’re making a game that captures the essence of Fallout, we decided to take a look at what the big picture of a Fallout narrative looks like. A word of warning: the section below will contain spoilers for the Fallout games, so if you haven’t played them all, you may wish to skip to the end! When we dug into the narrative of the big Fallout titles, we came to the realization that Fallout 3 and 4 are surprisingly linear. Fallout 3 has two factions you pick, both embodying the Hollywood definition of Good Guy/Bad Guy. Fallout 4 was a bit more complicated, only instead of choosing between 2 factions for the 3rd Act, the player’s choice was expanded to 4. The Enclave being a bad guys and not even an option. There’s no complexity in negotiating between the factions, instead of having a weak karma or rep system, Fallout 4 just got rid of them altogether in favor of a streamlined approach to the battle for the Commonwealth. The Design Team moved that we take a look at Fallout: New Vegas for inspiration regarding their factions and how they interact with each other. The script team took a look into the inner workings of F:NV and the difference between that and F:3 was staggering. Just looking at one main story quest, for example. In addition to the karma system, there was a faction system that dictated the player standing with various factions in the wasteland. Fallout: New Vegas, had as many as 15 factions, most of them diametrically deposed that the player had to navigate, court and/or destroy in order to get what they want. So we began our search for a narrative flowchart of Fallout: New Vegas to see what a truly complex and nonlinear questline looked like. 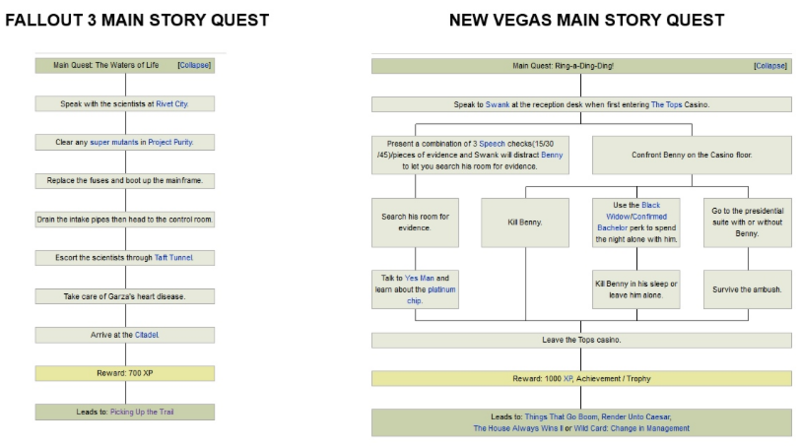 When attempting to find the Fallout: New Vegas main quest flow chart, we found none. The best we had was all of the quests in the Fallout: New Vegas wiki, but they were disjointed and in no visual presentation like the questlines for Fallout 3 and 4. So we pulled up the Fallout: New Vegas wiki, took a ton of screenshots, and assembled the quests together to get a glance into what we were dealing with. We took a couple of weeks piecing, the quests together in a handy dandy flowchart, and it was pretty fun at first. We were not prepared to see what we saw when we step back. 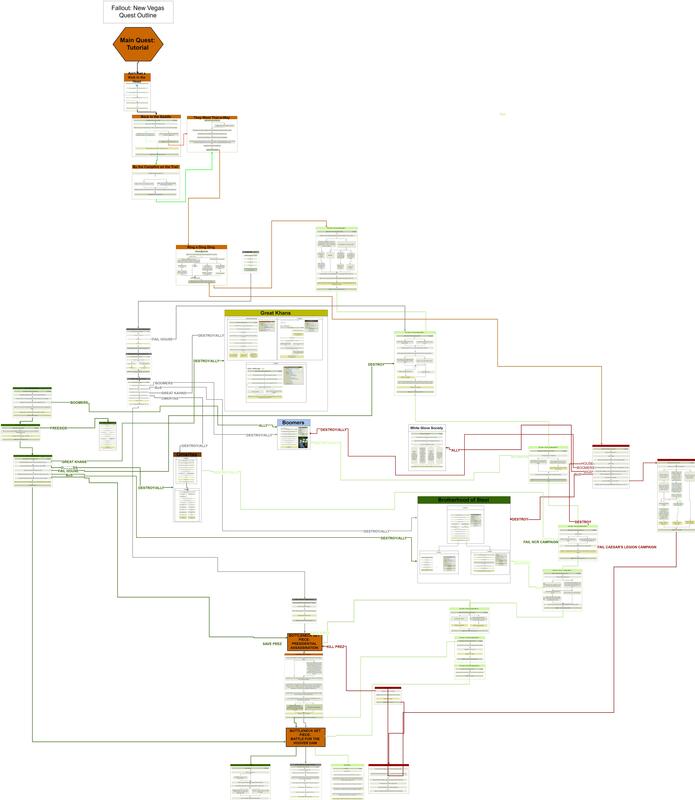 Just to give you an idea of the web of madness we began to weave, here’s a bird's eye view of the insanity. If you look out the left of the aircraft, you can see a roadmap to an unnecessarily complicated pile of narrative spaghetti you need to make sense of before anyone can have any faith in the project. NO PRESSURE. We’re still working on completing the flow-chart but the more we finish, the more we understand how simultaneously intimidating and simple an open world game looks like. Our biggest discovery in searching for how to make a nonlinear storyline, is that there is no such thing as a nonlinear storyline. At least not in the terms of writing an open world game. Even in a faction driven story such as Fallout: New Vegas, there’s still structure. Act I: Sets the stage, the stakes and makes the player care, or not care about the world around them. The Courier barely survives being shot in the head and pursues their would be assassin. Act II: The main conflict is introduced and our hero goes out to quest it - The Courier gets the Platinum chip and is sought out by all major players seeking to control the Mojave Valley. On some level it was a bit disappointing, but when we started digging into the plot we found out, it’s really ok. In order for a game to make any sense, and not grow exponentially in scope, similar narrative beats have to be hit. You can’t have drastically different set pieces for everything tiny decisions, unless you’re on a Half-Life 3 development schedule. Moreover, even if you have the same battles for every playthrough, you have multiple factions, including the player, wanting the same thing. Watching opposing factions kill each other over a power plant puts the player into a high stake situation and makes their decision who to back impact that much harder. The magic of having a “nonlinear storyline” is less about the different “whats” of the narrative, and more about the “hows.” Making your little choices have an impact. Are you going to back the NCR/Caesar’s Legion and massacre the opposing force? Or are you going to talk your way out of conflict and use stealth to avoid conflict while they kill each other? Your choice to protect and help people determining in some cases whether or not they live or die. A book you can finish in 10-20 hours, but with open world games, you can spend that amount of time with companions, factions, and those investments all need payoff. If you’ve invested hours making life better for your companions, they’ll let you know. On and off the battlefield. If you’ve spent hours building your faction up with side quests and diplomacy, you’ll see it. Both in their bases and on the world map. It’s a film maker’s responsibility to make sure the message and tone of a book is respected and executed properly on the big screen. They continue to do this, even if they can’t do everything. We take this same responsibility very seriously. So our narrative path is laid. If you have a suggestion regarding a blog post topic, or how to improve our existing plans, please leave a comment below. We’re all new at this and always eager to improve. If you have any questions about the game's’ narrative, Wasteland Wailers’ songs, or just want to shoot the breeze, I can be found on the Overmare forums and [email protected] .